Visitors to Lahore have usually heard about the Mughal monuments. But where do they find details about accessing these historic sites or things to do in the modern city? ‘In Lahore: A Contemporary Guide to the City’ attempts to fill this information gap. 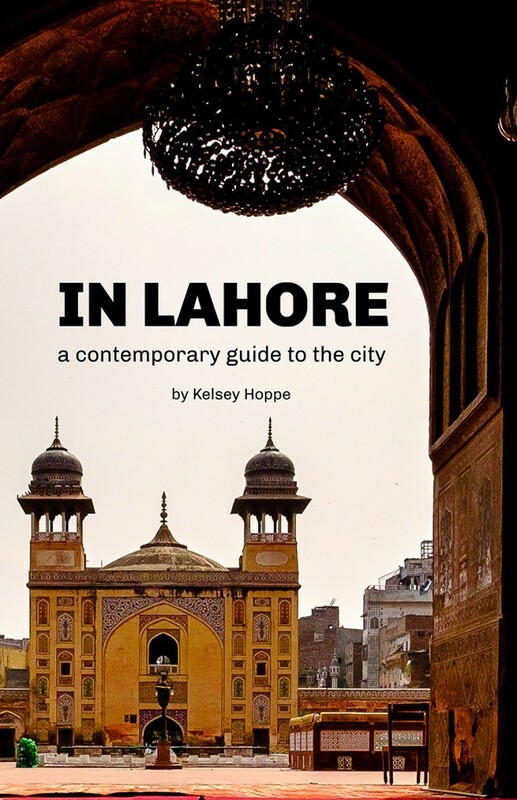 The guide is written by Kelsey Hoppe, an organizational development and security consultant who worked in Pakistan for three years beginning in 2013. It features photographs by Ben French and Taimoor Baig. The book is available for purchase on Amazon. Pakistani readers can glimpse some of the guide’s photos and order online through the project’s website. The guide will be launched at the Lahore Literary Festival and Hoppe will be speaking about it there. We spoke with her ahead of the festival to learn about her experience working on the city guide. When did you first visit Lahore? What sparked your initial interest in the city and what helped you build an attachment to it subsequently? By the time, we moved there we’d already visited a few times so I had seen most of the regular ‘tourist’ stops – the Fort, Wagah border, Badshahi Mosque. But I knew we had only scratched the surface. The whole city has a romantic charm which envelopes you but to truly get to know it I needed more than the odd weekend. Of course, the tourist charm wears off after spending hours in traffic anywhere but this was replaced with a deeper curiosity. Lahore was happy to oblige. Living in Lahore gave us the opportunity to get to know more people and places. Like eating at dhabas in the Old City, or visiting artists at home, doing a calligraphy class at Naqsh School of Arts or watching the sunset from the top of Arfa Karim Towers. 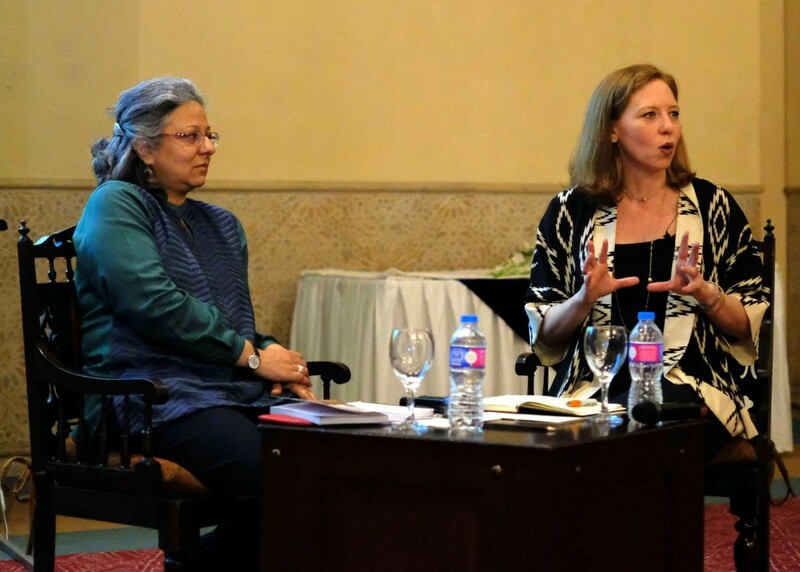 Kelsey Hoppe (left) speaks during her book launch session organized by the Asian Study Group. How did the idea for a guidebook come about? Was it a simple genre choice or did something else make you decide on this form? While we were living in Lahore we had a lot of visitors and each time they would want to know where to go and what to see. Initially, In Lahore was just 10 or so pages printed off at home for people we knew. My husband is a great photographer though and we have a photographer friend, Taimoor Baig, so as we lived there we were also accumulating this huge set of beautiful pictures. The idea really came to fruition though when we knew we were going to be leaving. We had built up so much knowledge about the city and the thought it would just be lost and that new visitors would come and have to re-discover it all seemed like such a waste. We had the content at our fingertips so why not do something with it? We also wanted to encourage people to have a different view of the city than the one they had preconceived. Sadly, almost all foreigners who come in from abroad believe Pakistan to be dangerous. I can tell someone to go see Shahi Hamam and wax eloquent about how beautiful it is but someone who isn’t from Lahore and believes Lahore to be dangerous is going to ask: where it is, and how to get there, and how much does it cost, and is it safe. I thought if we could put a resource in people’s hands and they could see Shahi Hamam and have website links and tour guide numbers at their fingertips they’d be more likely to go and enjoy the place. If they enjoy it, maybe they’ll tell their friends and family that Pakistan isn’t all terrorism and poverty. In my small way I hope it does contribute to a different view of Pakistan. The Pakistan that we came to know and love. What kind of response did you get to this project (among friends, family, co-workers, potential publishers) while you were working on it? When we were working on the project everyone was very supportive. There’s really nothing controversial about writing a city guide though! But the response after it was published has been overwhelming. Especially from Lahoris themselves. I think that’s because it’s not until you hold an entire book in your hands that you realise how much there is to do in Lahore. And not just a couple of Mughal mosques. The food, the art, the gardens and parks, the festivals, the shopping, the things to do with kids, the day trips out and around Lahore. There’s a lot happening in the city at any given time! As we were really writing the book for visitors to Lahore I assumed that most of the people buying it would be foreigners but it’s been the opposite. Most people buying it are Lahoris who just want a beautiful book about their city. Or, people buy it for their family who are abroad who miss and love Lahore. Having people from Lahore embrace the book has really been heartwarming. We decided early on to self-publish the book because it’s a niche market of readers and we wanted to be able to have control over the design and publish it relatively quickly. Luckily, we were introduced to Topical Publishers in Lahore who print beautiful books. Through them we were able to print it in Pakistan and make it available widely here. People can order it online and it’ll be delivered directly to them. The market abroad has been very receptive as well. Stanfords, the famous travel bookstore in London, is going to carry as when I approached them they said they had nothing else on Pakistan. A lot has been written about Lahore. What do you think differentiates your guide from others? A lot has been written about Lahore and I relied heavily on what was already there for information. In Chapter 9 of the book on literature, art, and music I have compiled a list of everything I could find that is available to people in writing about Lahore. Bapsi Sidhwa’s the Illustrated Beloved City, Majid Sheikh’s and F.S Aijazuddin’s books, and Mohsin Hamid – just to name a few. I think what differentiates In Lahore is that I wasn’t aiming for great prose, per se, although I hope people do enjoy reading it. I wanted a true city guide. Something people would put in their bag as they spent the weekend in Lahore and were deciding what they wanted to see and where they wanted to eat. At the moment, the only thing that exists like it is small blurbs in big travel guides like Lonely Planet and these don’t even begin to touch on all there is in Lahore and the pictures certainly don’t capture the beauty of the city. What’s next on the cards as far as your writing is concerned? In Lahore is launching at the Lahore Literary Festival at the end of the month and I’m excited to be going and speaking at that. I’ll also be working to more widely distribute the book both in Pakistan and abroad. Publishing a book is really only the beginning of the work! I’ve just finished another book which will be published in April, Staying Safe on Your Gap Year, which is travel safety and security for young people. But, I also have an idea for a novel which is based in Pakistan bubbling away at the back of my mind. Even though we’ve moved away I definitely think that I’ll never truly leave Pakistan.